Sepp Blatter resigns: FIFA running blog. So Why Did Sepp Blatter Resign From FIFA? 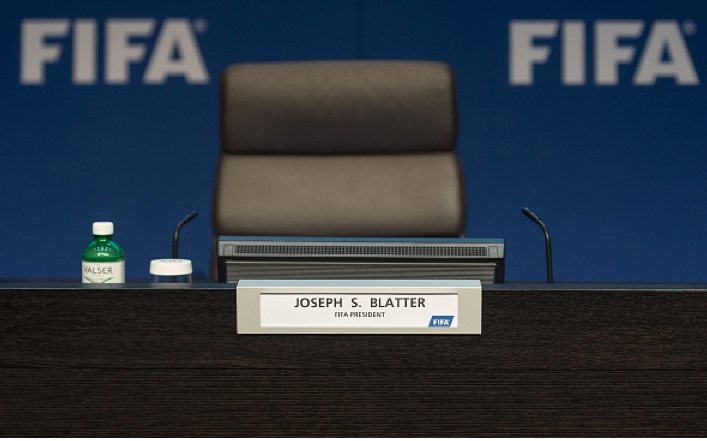 Sepp Blatter’s chair before the Zurich press conference where he announced his resignation from FIFA. Update, 3:25 p.m.: As mentioned below, Sepp Blatter has weathered a number of corruption scandals during his time as FIFA president, which raises the question of exactly why he’s chosen to resign now—having just been re-elected and not having been indicted by the U.S. corruption investigation that led to the arrests of a number of other officials. For his part, Blatter says he believes FIFA needs further reform and that his notoriety among non-FIFA soccer officials and the general public has eradicated his “mandate” as international soccer’s leader. I felt compelled to stand for re-election, as I believed that this was the best thing for the organisation. That election is over but Fifa’s challenges are not. Fifa needs a profound overhaul. While I have a mandate from the membership of Fifa, I do not feel that I have a mandate from the entire world of football – the fans, the players, the clubs, the people who live, breathe and love football as much as we all do at Fifa. As far as it goes, that is true, but it’s also been true for quite some time—again, why acknowledge it now? Swiss investigators say Blatter is not under investigation in that country, which is looking into potential improprieties in the selection of Russia and Qatar to host the next two World Cups. Reporting suggests, however, that Blatter might be a subject of ongoing U.S. interest. Source tells ABC News that Blatter was indeed subject of FBI investigation. Indeed, the New York Times’ headline on its Monday report on inquiries into FIFA general secretary Jerome Valcke (described below) asserted that U.S. investigators were “drawing closer” to implicating Blatter. Perhaps there was some specific development in a criminal investigation which convinced Blatter that in short order even he, the perennial survivor, would not be able to hold on to the FIFA presidency. Or perhaps he felt the way the wind was blowing and decided to attempt a slight salvaging of his reputation—he says his remaining time in office will be spent pursuing reforms—while getting out on his own terms. Or perhaps something else happened altogether which will be just as shocking, when we learn about it, as the other completely out-of-nowhere developments that have exploded into the news in recent days! Update, 1:05 p.m.: In a shocking move, FIFA President Sepp Blatter announced at a hastily called Zurich press conference Tuesday—only some 15 people were reportedly in attendance—that he is resigning from soccer’s international governing body. An “Extraordinary Congress” will be held no sooner than four months from today to choose his replacement, and other significant organizational reforms are said to be planned. Blatter has been president of FIFA since 1998 and was re-elected to that position last week even after Swiss authorities arrested a number of top soccer officials on United States corruption charges. Blatter has long been infamous for retaining power amid similar scandals, though Tuesday morning’s revelation that his second-in-command had seemingly been involved in the distribution of a $10 million bribe was perhaps closer than any investigation had come to implicating him personally. Much more to come on this story. Neither the Secretary General Jérôme Valcke nor any other member of FIFA’s senior management were involved in the initiation, approval and implementation of the above project. But on Tuesday at about 4 a.m. ET, British journalist Martyn Ziegler posted a letter from South Africa’s soccer association to FIFA—addressed directly to Valcke—asking him to facilitate the $10 million transfer. FIFA has responded to this news by asserting in essence that Valcke receives all FIFA correspondence as a formal matter of course. The organization also says the payment was in fact authorized by the former head of its finance committee, who is—perhaps conveniently—dead.